Ethiopia has one of the fastest-growing economies in the world and is Africa's second most populous country. Many properties owned by the government during the previous regime have now been privatized and are in the process of privatization. However, certain sectors such as telecommunications, financial and insurance services, air and land transportation services, and retail, are considered as strategic sectors and are expected to remain under state control for the foreseeable future. Almost 50% of Ethiopia's population is under the age of 18, and even though education enrollment at primary and tertiary level has increased significantly, job creation has not caught up with the increased output from educational institutes. The country must create hundreds of thousands of jobs every year just to keep up with population growth. Though the issuing of minted coins didn't begin until around 270, metal coins may have been used in Aksum centuries prior to centralized minting. The Periplus of the Erythraean Sea mentions that Aksum imported brass "which they use[d] for ornaments and for cutting as money", and that they imported "a little money (denarion) for [use with] foreigners who live there." Some outside influences encouraging the use of coins is undeniable. Roman, Himyarite, and Kushana coins have all been found in major Aksumite cities. The minting of coins began around 270 CE, beginning with the reign of Endubis. Around the 5th–8th century, the coffee plant was introduced into the Arab world from Ethiopia. Coffea arabica, the most highly regarded species, is native to the southwestern highlands of Ethiopia. Long before the cultivation of coffee, however, other food crops like finger millet, teff, sorghum, lablab bean and castor bean were domesticated and cultivated in Ethiopia. Following the overthrow of the Ethiopian monarchy a marxist military government nationalized all companies and land, expelled foreign investors, and pursued an extensive military expenditure. 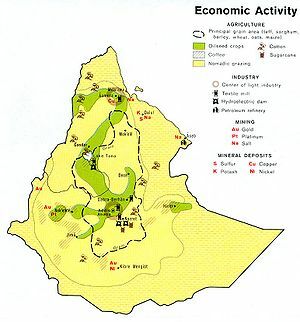 The Ethiopian economy significantly deteriorated due to the civil war and famines of the 1970s and 1980s. Since 1991, the Ethiopian government has embarked on a program of economic reform, including privatization of state enterprises and rationalization of government regulation. While the process is still ongoing, the reforms have attracted much-needed foreign direct investment. Coffee sorting process near Hawassa. As of 2015[update], agriculture accounts for almost 40.5% of GDP, 81 percent of exports, and 85 percent of the labour force. Many other economic activities depend on agriculture, including marketing, processing, and export of agricultural products. Production is overwhelmingly of a subsistence nature, and a large part of commodity exports are provided by the small agricultural cash-crop sector. Principal crops include coffee, pulses (e.g., beans), oilseeds, cereals, potatoes, sugarcane, and vegetables. Exports are almost entirely agricultural commodities, with coffee as the largest foreign exchange earner, and its flower industry becoming a new source of revenue: for 2005/2006 (the latest year available) Ethiopia's coffee exports represented 0.9% of the world exports, and oilseeds and flowers each representing 0.5%. Ethiopia is Africa's second biggest maize producer. In 2000, Ethiopia's livestock contributed to 19% of total GDP. As of 2008[update], some countries that import most of their food, such as Saudi Arabia, have begun planning the purchase and development of large tracts of arable land in developing countries such as Ethiopia. This land grabbing has raised fears of food being exported to more prosperous countries while the local population faces its own shortage. Forest products are mainly logs used in construction. The silvicutural properties are used in construction and manufacturing, and as energy sources. Ethiopia's fisheries are entirely fresh water, as it has no marine coastline. Although total production has been continuously increasing since 2007, the fishing industry is a very small part of the economy. Fishing is predominantly artisanal. In 2014, nearly 45,000 fishermen were employed in the sector with only 30% of them employed full-time. The mining sector is small in Ethiopia. The country has deposits of coal, opal, gemstones, kaolin, iron ore, soda ash, and tantalum, but only gold is mined in significant quantities. In 2001 gold production amounted to some 3.4 tons. Salt extraction from salt beds in the Afar Depression, as well as from salt springs in Dire and Afder districts in the south, is only of internal importance and only a negligible amount is exported. On 30 August 2012 it was announced that British firm Nyota Minerals was about to become the first foreign company to receive a mining licence to extract gold from an estimated resource of 52 tonnes in western Ethiopia. Waterpower and forests are Ethiopia's main energy sources. The country derives about 90 percent of its electricity needs from hydropower, which means that electricity generation, as with agriculture, is dependent on abundant rainfall. Present installed capacity is rated at about 2000 megawatts, with planned expansion to 10,000 megawatts. In general, Ethiopians rely on forests for nearly all of their energy and construction needs; the result has been deforestation of much of the highlands during the last three decades. Less than one-half of Ethiopia's towns and cities are connected to the national grid. Petroleum requirements are met via imports of refined products, although some oil is being hauled overland from Sudan. Oil exploration in Ethiopia has been underway for decades, ever since Emperor Haile Selassie granted a 50-year concession to SOCONY-Vacuum in September 1945. Recent oil and gas discoveries across East Africa have seen the region emerge as a new player in the global oil and gas industry. As exciting as the huge gas fields of East Africa are, however, the strong decline in oil prices and expectations for an L-shaped recovery with low prices over the coming years are increasingly challenging the economic viability of the industry in this region. The reserves are estimated at 4 trillion cubic feet (110×10^9 m3), while exploration for gas and oil is underway in the Gambela Region bordering Sudan. The discoveries were expected to drive billions of dollars in annual investment to the region over the next decade. According to BMI estimates, the findings in the last few years are more than that of any other region in the world, and the discoveries are expected to continue for the next few years. However, falling global oil prices are threatening the commercial viability of many of these gas prospects. A program to privatize state-owned enterprises has been underway since the late 1990s. There has been a large growth of manufacturing in Ethiopia. Several industrial parks have been built with a focus on textiles. Ethiopian Airlines is the largest and most profitable airline in Africa. Prior to the outbreak of the 1998–2000 Eritrean–Ethiopian War, landlocked Ethiopia mainly relied on the seaports of Asseb and Massawa in Eritrea for international trade. As of 2005[update], Ethiopia uses the ports of Djibouti, connected to Addis Ababa by the Addis Ababa – Djibouti Railway, and to a lesser extent Port Sudan in Sudan. In May 2005, the Ethiopian government began negotiations to use the port of Berbera in Somaliland. As of 2016, there are 113,066 kilometres (70,256 mi) all-weather roads. Ethiopian Airlines, is Africa's largest airline and most profitable airline. It serves 123 destinations and has a fleet size of 97 aircraft. The Ethiopian railway network has been rapidly expanding. In 2015, the first light rail in Africa was opening in Addis Ababa. In 2017, the electric Addis Ababa-Djibouti railway began operations. Presently, two other electric railways are under construction: Awash-Woldiya and Woldiya-Mekelle. Telecommunications are provided by a state-owned monopoly, Ethio Telecom, formerly the Ethiopian Telecommunications Corporation. Aside from wholesale and retail trade, transportation, and communications, the services sector consists almost entirely of tourism. Developed in the 1960s, tourism declined greatly during the later 1970s and the 1980s under the military government. Recovery began in the 1990s, but growth has been constrained by the lack of suitable hotels and other infrastructure, despite a boom in construction of small and medium-sized hotels and restaurants, and by the impact of drought, the 1998–2000 war with Eritrea, and the specter of terrorism. In 2002 more than 156,000 tourists entered the country, many of them Ethiopians visiting from abroad, spending more than US$77 million. In 2008, the number of tourists entering the country had increased to 330,000. In 2015, Ethiopia was ranked the "World's Best Tourist Destination" by the European Council on Tourism and Trade. The following table displays the trend of Ethiopia's gross domestic product at market prices, according to estimates by the International Monetary Fund with figures in millions of Ethiopian Birr. The current GDP (USD) per capita of Ethiopia shrank by 43% in the 1990s. The following table shows the main economic indicators in 1980–2017. Inflation below 5 % is in green. 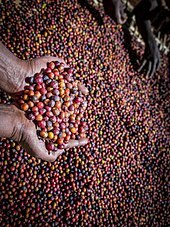 Until 2013, the major agricultural export crop was coffee, providing about 26.4% of Ethiopia's foreign exchange earnings. In the beginning of 2014, oilseeds exports have been more important. Coffee is critical to the Ethiopian economy. More than 15 million people (25% of the population) derive their livelihood from the coffee sector. Other exports include live animals, leather and leather products, chemicals, gold, pulses, oilseeds, flowers, fruits and vegetables and khat (or qat), a leafy shrub which has psychotropic qualities when chewed. Cross-border trade by pastoralists is often informal and beyond state control and regulation. In East Africa, over 95% of cross-border trade is through unofficial channels and the unofficial trade of live cattle, camels, sheep and goats from Ethiopia sold to Somalia, Kenya and Djibouti generates an estimated total value of between US$250 and US$300 million annually (100 times more than the official figure). This trade helps lower food prices, increase food security, relieve border tensions and promote regional integration. However, there are also risks as the unregulated and undocumented nature of this trade runs risks, such as allowing disease to spread more easily across national borders. Furthermore, the government of Ethiopia is purportedly unhappy with lost tax revenue and foreign exchange revenues. Recent initiatives have sought to document and regulate this trade. Dependent on a few vulnerable crops for its foreign exchange earnings and reliant on imported oil, Ethiopia lacks sufficient foreign exchange. The financially conservative government has taken measures to solve this problem, including stringent import controls and sharply reduced subsidies on retail gasoline prices. Nevertheless, the largely subsistence economy is incapable of supporting high military expenditures, drought relief, an ambitious development plan, and indispensable imports such as oil; it therefore depends on foreign assistance. In December 1999, Ethiopia signed a $1.4 billion joint venture deal with the Malaysian oil company, Petronas, to develop a huge natural gas field in the Somali Region. By the year 2010, however, implementation failed to progress and Petronas sold its share to another oil company. ^ a b c d e f g h "World Economic Outlook Database, October 2018". IMF.org. International Monetary Fund. Retrieved 11 February 2019. ^ "January 2019 Global Economic Prospects -- Darkening Skies p. 112" (PDF). openknowledge.worldbank.org. World Bank. Retrieved 23 March 2019. ^ a b c d e f g h i j k l m n o "The World Factbook". CIA.gov. Central Intelligence Agency. Retrieved 11 February 2019. ^ "Poverty headcount ratio at national poverty lines (% of population)". data.worldbank.org. World Bank. Retrieved 11 February 2019. ^ Selima., Jāhāna (2015). Work for human development (PDF). Human Development Report. United Nations Development Programme. ISBN 9789211263985. OCLC 936070939. ^ "GINI index (World Bank estimate)". data.worldbank.org. World Bank. Retrieved 11 February 2019. ^ "Unemployment, total (% of total labor force) (modeled ILO estimate)". data.worldbank.org. World Bank. Retrieved 11 February 2019. ^ "Doing Business in Ethiopia - World Bank Group". www.doingbusiness.org. Archived from the original on 11 January 2017. Retrieved 10 January 2017. ^ "S&P Global Market Intelligence". www.capitaliq.com. Retrieved 16 April 2018. ^ "Moody's: Ethiopia's credit profile balances high growth and low debt costs against range of challenges". moodys.com. 1 August 2017. Retrieved 16 April 2018. ^ "Press Release". www.fitchratings.com. Retrieved 16 April 2018. ^ Sanchez, Dana (2017-01-10). "Ethiopia Moves Toward Privatization. It's Not about Money. It's About Tech". AFKInsider. Archived from the original on 12 January 2017. Retrieved 2017-01-12. ^ Maasho, Aaron (21 March 2015). "Ethiopia launches 4G mobile service in the capital". Reuters. Archived from the original on 12 January 2017. Retrieved 11 January 2017. ^ Maasho, Aaron (29 March 2015). "Ethiopia sells off seven state firms, to offer more". Reuters. Archived from the original on 12 January 2017. Retrieved 11 January 2017. ^ "Ethiopia sells off seven state firms, to offer more". Reuters. 19 March 2012. Retrieved 27 December 2012. ^ "A brittle Western ally in the Horn of Africa". The Economist. 1 November 2007. ISSN 0013-0613. Archived from the original on 11 January 2017. Retrieved 11 January 2017. ^ Munro-Hay, Stuart C. (1991). Aksum: An African Civilisation of Late Antiquity (PDF). Edinburgh University Press. pp. 151–154. ISBN 9780748601066. OCLC 24695872. ^ Souza, Ricardo M. (2 September 2008). Plant-Parasitic Nematodes of Coffee. Springer Science & Business Media. pp. 3, 165. ISBN 9781402087202. ^ Carney, Judith (1 February 2011). In the Shadow of Slavery: Africa's Botanical Legacy in the Atlantic World. University of California Press. pp. 18–19, 31. ISBN 9780520949539. Ethiopia is the birthplace of the world's premier coffee (Coffea arabica). ^ Murphy, Denis J. (19 July 2007). People, Plants & Genes: The Story of Crops and Humanity. OUP Oxford. p. 95. ISBN 9780199207138. OCLC 191050253. ^ Seid, Yared; Taffesse, Alemayehu S.; Ali, Seid Nuru (8 November 2016). Ethiopia—an agrarian economy in transition (PDF). Africa's Lions: Growth Traps and Opportunities for Six African Economies. Brookings Institution Press. ISBN 9780815729501. OCLC 961309230. ^ "Ethiopia. CIA The World Fact Book". CIA Factbook. Retrieved 10 January 2017. ^ "Get the gangsters out of the food chain". The Economist. 7 June 2007. ^ Food and Agriculture Organization (May 2004). "Livestock Sector Brief: Ethiopia" (PDF). FAO Country Profiles. FAO. p. 1. Retrieved 7 November 2011. ^ Wakjira, Dereje T.; Gole, Tadesse W. (2007). "Customary Forest Tenure in Southwest Ethiopia". Forests, Trees and Livelihoods. 17 (4): 325–338. doi:10.1080/14728028.2007.9752607. ISSN 1472-8028. ^ Lemenih, Mulugeta; Bongers, Frans (1 January 2011). Günter, Sven; Weber, Michael; Stimm, Bernd; Mosandl, Reinhard, eds. Silviculture in the Tropics. Tropical Forestry. 8. Springer Berlin Heidelberg. pp. 261–272. doi:10.1007/978-3-642-19986-8_17. ISBN 9783642199851. ^ a b c d e Ethiopia country profile. Library of Congress Federal Research Division (April 2005). This article incorporates text from this source, which is in the public domain. ^ "Is East Africa's gas asset boom about to go bust?". Mineweb. Retrieved 18 February 2016. ^ "Africa's exports by region | Bright Africa". www.riscura.com. Retrieved 18 February 2016. ^ "Oil And Gas Discoveries Near Africa's East Coast To Soon Drive Billions In Investments: PWC". International Business Times. Retrieved 18 February 2016. ^ Krauss, Clifford (16 January 2016). "Oil Prices: What's Behind the Drop? Simple Economics". The New York Times. ISSN 0362-4331. Retrieved 18 February 2016. ^ "Ethiopia - Road and Railways". export.gov. 21 June 2017. ^ "Ethiopian Airlines 2015 outlook: more rapid expansion as it becomes Africa's largest airline". CAPA Centre for Aviation. 13 January 2015. Archived from the original on 10 January 2017. ^ "UNdata country profile: Ethiopia". Retrieved 15 July 2011. ^ "Ethiopia is named World's Best Tourism Destination". dailymail.co.uk. Retrieved 16 April 2018. ^ "Report for Selected Countries and Subjects". www.imf.org. Retrieved 2018-09-13. ^ "What We Do". Archived from the original on 20 February 2009. Retrieved 11 June 2015. ^ "Report for Selected Countries and Subjects". www.imf.org. Retrieved 2018-10-17. Hausmann, Ricardo; Hidalgo, César A.; Bustos, Sebastián; Coscia, Michele; Simoes, Alexander (17 January 2014). The Atlas of Economic Complexity: Mapping Paths to Prosperity. MIT Press. ISBN 9780262525428. OCLC 836557569. World Bank Group (2 December 2016). Why so idle? Wages and Employment in a Crowded Labor Market (PDF) (Report). Retrieved 11 January 2017. This page was last edited on 15 April 2019, at 06:59 (UTC).